Viru is one of the three biggest beers produced in Estonia. Despite having a population of only 1.3 million people, and only having gained independence from Russia 20 years ago, Estonia has a 1500 year brewing tradition. I find it odd that all Estonian beers are brewed in Tartu, the second largest Estonian city, and not the capital Talinn. The packing describes this beer as 'Premium Estonian Beer' and having had it before, it's quite good. The packaging goes on to say: "Estonia is a smaall country, so we can't make enough Viru for everyone. Since you've now found some, enjoy it while it lasts." However seeing as roughly 15% of the breweries total production end up in Australia (amazing stat!) if you go to a specialty beer shop there is normally some there. Ok, now the beer. You pick up the oddly shaped beer bottle hoping it will pour well and it really does! I will talk more about the bottle later because it is fantastic, anyway the colour is brilliant! It's quite yellow with a good sized white head, which may be a touch on the short lived side but not too bad. The head drops off to a rings which leaves some lacing, despite the mountain of bubbles which should help with head retention. Not to worry though the beer still looks excellent! There is not alot of action from this beer on the nose. The beer smells very bready, however it also has a sweet element to this bread. As much as I don't want to say this the odour reminds me of a KFC dinner roll with that slightly sickly sweet taste... At the tailend of the aroma there are hints of floral or herbal hops but not enough to balance the beer. The smell that is there is quite mild, which will help it not offend but it also will not entice anyone. This beer is a really easy drinking lager, and pretty quickly I find I have a problem with the American Adjunct Lager classification. I can't taste any adjuncts and I feel this should definitely be considered a Euro Pale Lager. The taste is quite similar to the smell, slightly sweet malts with a citrus twist. The hops are more dominant than expected and in fact are quite high quality. The body is quite light and the beer has excellent carbonation. Really nice lager! Overall Viru is a solid beer. I worry for the company that they are not making enough money out of it however. The octagonal-pyramid bottle must cost a small fortune to make, and when you factor in the production costs of the beer and then shipping, in my case to Australia, how can they possible sell it for $9 a 4-pack! I would believe that the distinctive shape, designed to emulate a medieval type of Estonian turret, probably accounts for a large number of first time sales. This beer however is good enough that I now normally have some at home, and would more than happily recommend it to all! If you like lagers go get some of this, because in Australia there is usually plenty of it and it could come out cheaper to drink this than Carlton Draught, and trust me it's a better beer! Wow .. Love this beer myself, but where did you buy for $9 a four pack? 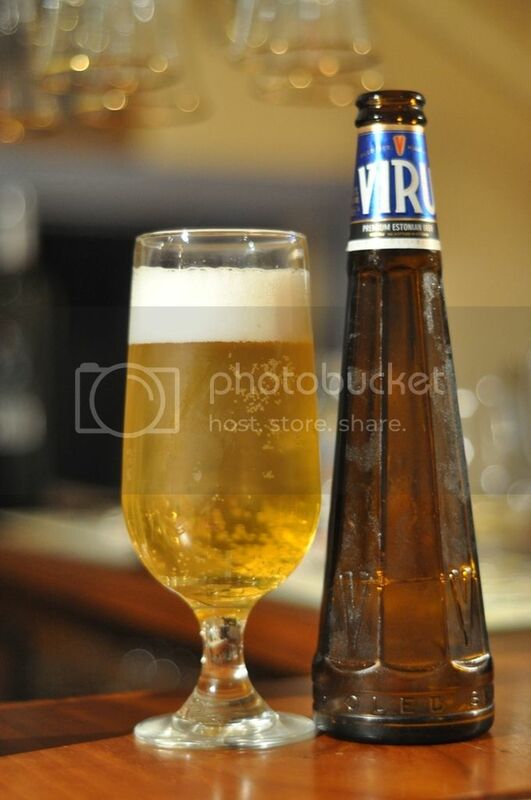 Is viru beer available to buy in Victoria anywhere.I cant find it any store including the store in stkilda.